When we decided to open the Inn on South Fifth, we knew that we wanted our guests to experience and enjoy the same high quality accommodations and dining choices that we want when we are traveling. If we prefer restaurants that serve organic and/or locally grown food, then we would expect our guests to want the same. We have food allergies and a preference for vegan fare, so we appreciate when our needs are thoughtfully considered and options provided. 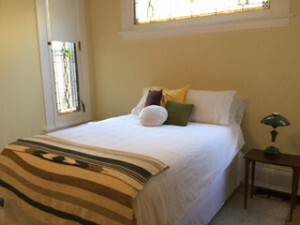 If we prefer our away from home accommodations to support and promote the local economy, then we also would want to do the same for our guests that stay at the Inn. At the Inn on South Fifth, besides knowing that the breakfast we serve, and other food & beverages we provide, are either organic, naturally made or locally grown, we also have taken great care in buying furniture and as many of our amenities through our local markets. A “no brainer” for us was to purchase all of the mattresses and box springs from Legacy Furniture located at the Bag Factory in Goshen. The mattresses and box springs are made in Shipshewana by Karen’s cousin, Mervin Lehman. Many of the eclectic room furnishings are from local stores, either Legacy or other locally run re-sale stores and outlets. 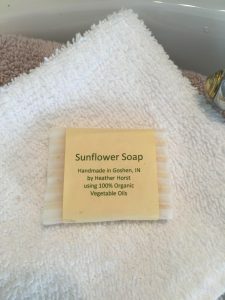 We’re very pleased that local artisan and massage therapist, Heather Horst, was willing to work with us on providing small travel-size soap that she makes in her home. (You can find Heather’s soaps on sale at Maple City Market.) While the winter down covers that are on each bed are not locally made or purchased, they are made in the USA! So where do we buy our food? Almost everything we serve is purchased at Maple City Market. The Market is less than a block from the Inn on Main Street. We buy a few items at the Farmer’s Market and sometimes when we can’t find what we need at the Market, we will go to our local Martin’s Store. Our coffee is roasted locally at the Refinery in Goshen. They have relationships with and know their coffee growers. We typically have a small refrigerator in the dining room stocked with our favorite microbrews! We love to talk about the process we went through in furnishing the Inn and in making decisions about the accommodations that we provide. Please come and stay with us!